It’s been a while since I’ve posted something for the garden foodies out there. This is my favorite time of year – when I get to eat what I grow! Here’s a simple meal that you can throw together in about 30 minutes. It’s super healthy, filling, and quick. First you want to gather your goodies from the garden. Slice open your zucchini and scoop out the seeds. Sprinkle with salt, pepper, and quality EVOO. Shout out to my favorite shop Blue Olive where my Garlic Infused EVOO and Himalayan Salt come from. Bake zucchini in 350 degree oven for about 20 minutes depending on size – it should be soft but not mushy. While zucchini is baking, combine 1 Tbsp. EVOO, chopped onions, 1 Tea salt & pepper, and herbs (chopped fine) and sauté in pan until onions are translucent. Add meat and cook thoroughly. Allow to cool, then add one egg and panko (between 1/2 & 1 cup depending on your taste). Remove zucchini from oven and stuff with meat mixture. Add small amount of cheese (optional) on top and drizzle with a little EVOO. 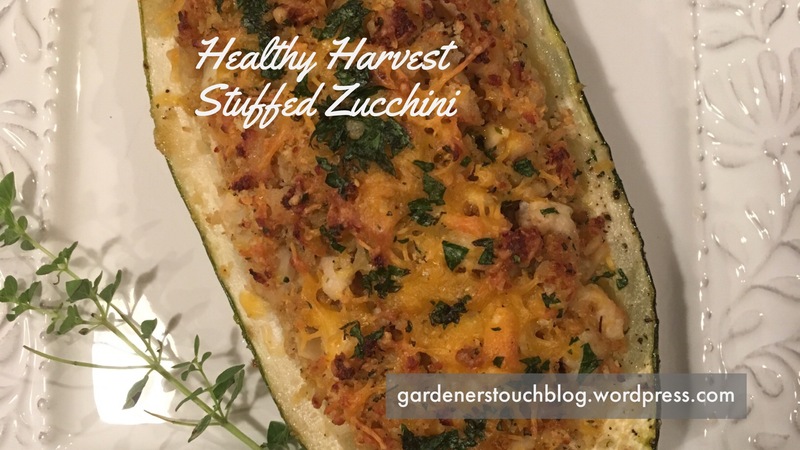 Return stuffed zucchini to oven for another 30-40 minutes (depending on size – mine was a larger zucchini). Remove from oven and drizzle with another splash of EVOO. Note: Aroma reaches the nose before the food reaches the mouth, so using fresh, in my opinion, is always best. Adding EVOO to your completed hot dish, releases it’s wonderful aroma. In this recipe, I used garlic infused oil and that added splash at the end really adds to the tasting experience. Fresh herbs from the garden are another punch of taste besides the beneficial health perks they offer. 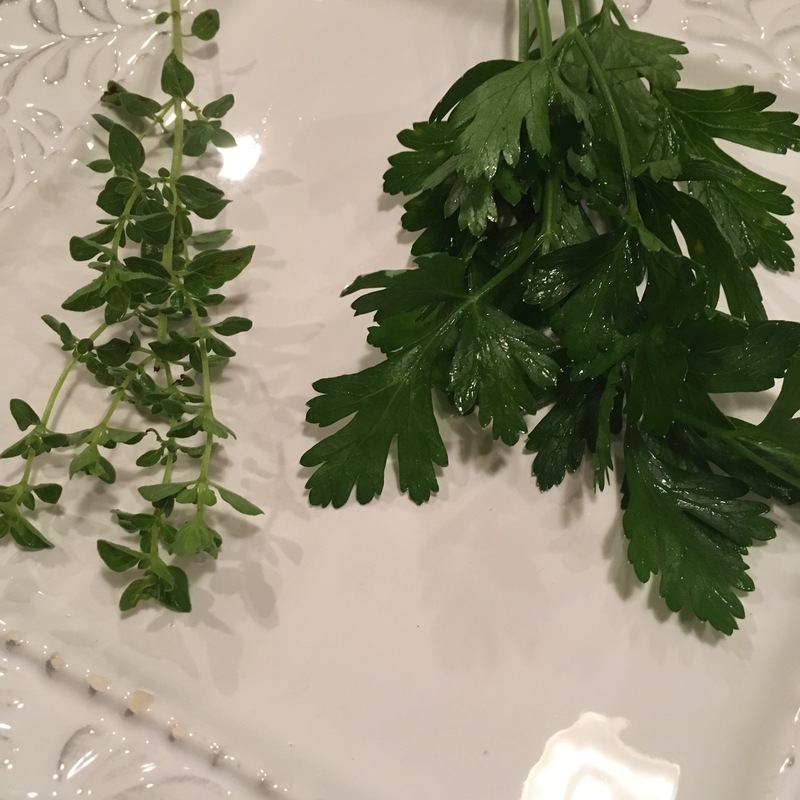 If you don’t know how to pair fresh herbs with vegetables, I found this article very helpful. Hi, Linda. Thought I’d pop over, after reading your comments on my site. I loved your note about “Gardening is a regenerative act…” I’ll have to remember that, when I’m feeling overwhelmed. I got my zucchini in late this year, so I’m still waiting my healthy harvest. How do you like True Blue olive oil? My old, favorite brand went out of business? Thanks for visiting. It’s always wonderful to chat with others who love gardening and the outdoors, especially someone who also lives in the Hudson Valley!! It’s such a beautiful place we live in – we are blessed. I love the Blue Olive. The owners are friends and I can truly say that they value education over sales. They love what they do and their passion is evident in the way they run their business. The product is top notch – I own far too many bottles. ;-)! Thanks for popping over the fence to chat! Sorry for the delay in responding. I was having difficulty with the site for a while. It’s true, gardens just bring new life and all its ups and downs along with it. I love the Blue Olive oil! I won’t use anything else. Best of luck with the garden!